I want to say hello to all the little people. Now that we’re billionaires, I want to assure you that I’ll still be here – online. I would never want you to think that I feel superior. Or that I don’t have time to mingle. Okay, fine. I know, I know. 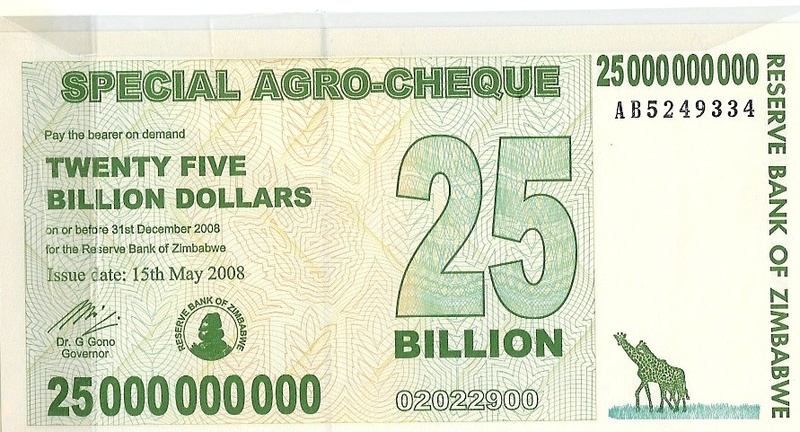 The value of my 25 billion Zimbabwe dollars is exactly….2.5 Zimbabwe dollars (They cut off 10 zeros. Just like that. Can they do that?). And in U.S. dollars? Yes, folks. What a windfall. uh oh, think it might be time to head home. you are snapping. it’s been fun and tiring – fun & work…home sounds good to me. How did you get Zimbabwe currency in the middle of Vermont?! Ellen – anything for you. What do you need? A million Zimbabwe dollars? 2 million? Liz – We bought the bill on eBay! You bought it? Heck, I could have probably gotten you about a trillion for free. Hope you didn’t pay more than $.20 for it! I was going to ask about the bill, too. I’ve never seen Zimbabwean (sp?) currency before. Tell me, what’s the image in the lower right of the bill? It looks a bit like a giraffe with a cannon on its back! Yes, Janet, a giraffe. Maybe two? I don’t see a cannon!